Remember in math class when you learned all those different shape names? Not really? 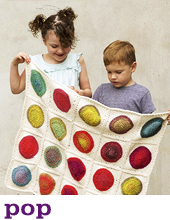 Meet polygon, a blanket of scrumptious garter hexagons. Each hexagon measures approximately 5.5” across, and the border is 1” wide. 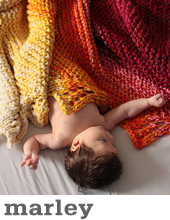 The blanket pictured requires 32 full hexagons and 6 half hexagons, and measures 29.5” wide by 37.5” long. Four layout options are illustrated in the pattern, however the blanket is modular, so you can adjust size by working more or less hexagons.